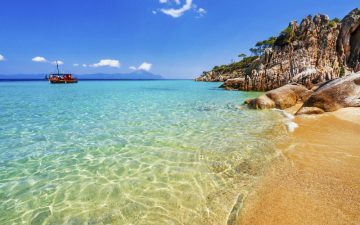 Curving around Zante’s most beautiful corner, Laganas has long been a favourite for mature travellers seeking sun, sand, and a bustling evening of entertainment. While a neon-lit strip of bars provide a youthful facade, long sandy beaches offer a timeless backdrop and maintain the eclectic appeal of the blossoming resort town. This isn’t just a party town for young people; a holiday to Laganas combines natural serenity with evening entertainment for all ages. Here’s why it’s such a popular Zante holiday. Laganas has blossomed from tiny fishing village to the bustling tourist hub of Zante, but its hotels and resorts are still surrounded by olive groves and fruit orchards. Spreading out either side of the town, there’s a huge choice of accommodation for a holiday to Laganas, with many affordable resorts within steps of the beach. As a general rule, anywhere half a mile from the bar strip should ensure a quiet night’s sleep. A five kilometre strip of sand gently shelves into warm Ionian waters, the Laganas Beach providing iconic days of serenity beneath the sun. Stretching from Kalamaki to Agios Sostis, this is one of Zante’s finest beaches and it’s more than broad enough to handle peak season crowds. Most of the beach is part of a designated marine reserve, ensuring it’s blissfully untouched despite the popularity. Loggerhead turtles nest here and their eggs are carefully monitored by local ecologists. Water sports are banned and help ensure the waters retain their pristine promise, nothing but pedalos and snorkellers exploring the topaz waters. Shallow waters and non-existent currents also make the beach ideal for less-confident swimmers. But it’s the length of the beach that most appeals. With a full five kilometres to go around, there’s always a quiet spot to lay down your towel. Zante is all about its beaches, the emerald isle fringed by a sublime loop of quiet sand. 30 minutes’ drive south from Laganas you’ll find Gerakas, another place for watching turtles and swimming in calm Ionian waters. Nearby Banana Beach is well organised with broad sections of sunbeds on the soft baking sand. Lounge beneath the umbrellas and the beach bars’ staff will do the rest. Then there’s Vrahos Beach, an ode to what Laganas must have looked like 30 years ago. A stretch of authentic tavernas stand beside the beach at Dafni, a secluded spot with an indelibly languid feel. There’s a beach for each day of the week with local boats providing regular transport to and from Laganas. While quiet and quaint, you’ll find tavernas and beach bars at each of them, as well as sun loungers that are often free. Follow the elegant turtles into the Ionian and there’s a wonderful calm. Glass-bottomed boats cruise out towards Turtle Island but it’s also relatively inexpensive to charter a small private boat. Out at sea there are turtle sightings galore, along with a beautiful place to anchor and swim. 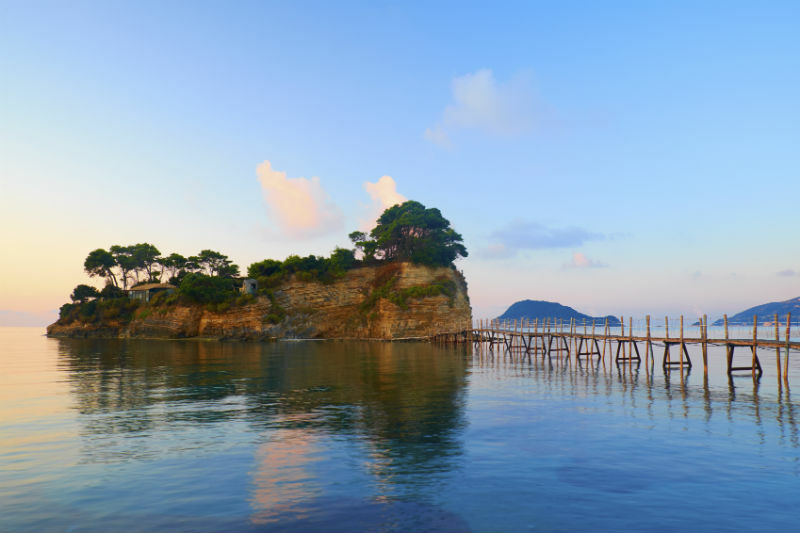 It’s the iconic day trip on a holiday to Laganos, a chance to escape into the tropical promise of Zante. Other boat cruises tour the nearby beaches with stops in deserted coves en route. Laganas deserves its reputation as the liveliest resort on Zante, with well over 100 bars sprawled along a neon strip that runs through the town. Some are clearly focused on the youthful crowd, opening until 8am and pumping out live music. But most are of the small and welcoming variety, Greek tavernas and British styled pubs having visitors returning night after night. Especially in the bars away from the centre, you’ll find free evening cabaret, relaxed terraces, and very reasonable drinks prices. The great appeal comes from the choice; there’s always going to be a bar that fits your mood. Jump on a bus and Zante Town is just 15 minutes away, the Venice of the South taking you on a journey through arcaded streets and chic little shops. Relax along the harbour front and dine on fresh seafood, or rise above the island and admire the views from Bohali Castle. There are a series of authentic Greek cafes to discover here as well, ideal if you’re seeking a sightseeing escape but don’t want to stray too far from a cold beer. There’s more that can be arranged through Laganas resorts. 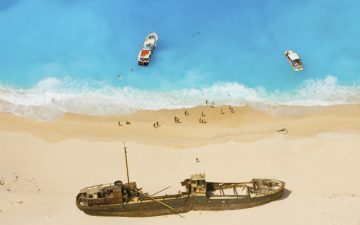 Zante is sprinkled with memorable attractions, including world-famous Shipwreck Beach. Laganas can be all about two weeks of beach and bars, yet it’s also a base for a Zante holiday that explores an island of emerald possibility.